Unhappy couples often present in ways that offer little promise their relationship can be saved, leaving the partners feeling helpless and the therapist feeling stumped. 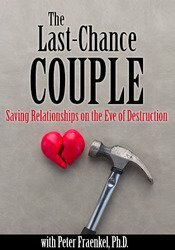 But hope can spring anew when we have a toolbox of techniques to help these couples interact in different ways, turning even the most toxic marriage, full of disdainful feelings, into one of positive growth. Watch Peter Fraenkel use recorded demonstrations that focus on four types of last-chance couples, and show how to engage them in transforming their relationship. Articulate clinical strategies to create open communication and safety between couples as it relates to treatment outcomes. Evaluate implicit time problems versus explicit time problems between a couple to inform the clinician’s choice of treatment interventions. Analyze the efficacy of introducing reframes of problem patterns for purposes of restoring positivity within the couple’s relationship. Peter Fraenkel Ph.D., is a couple therapist, psychologist, associate professor of psychology at City College of New York, and professional drummer who studied with Aretha’s drummer. He received the 2012 American Family Therapy Award for Innovative Contribution to Family Therapy, and is the author of Sync Your Relationship, Save Your Marriage: Four Steps to Getting Back on Track, and the forthcoming, Last Chance Couple Therapy: Bringing Couples Back from the Brink. Financial: Peter Fraenkel is in private practice. He is director of the Ackerman Institute for the Family’s Center for Work and Family. Non-financial: Peter Fraenkel has no relevant non-financial relationship to disclose. Colorado Social Workers: PESI, Inc. is an approved provider with the Colorado Chapter of the National Association of Social Workers. Provider #1413. This course has been approved for 2.7v continuing education hours.